The Arbel cliffs overlook the sea of Galilee, and were used by rebels in ancient times and as a fortress. Roman/Byzantine villages are located around the cliffs. The Arbel Cliffs hang over the sea of Galilee, and its natural caves were used as shelters for rebels against Herod, fortress during the revolt against the Romans and was fortified again in later periods. The ruins of a Hellenistic, Roman and Byzantine villages lie below the cliffs and on its south-western side. The cliffs are located on the north-west side of the Sea of Galilee (actually, it is a lake). 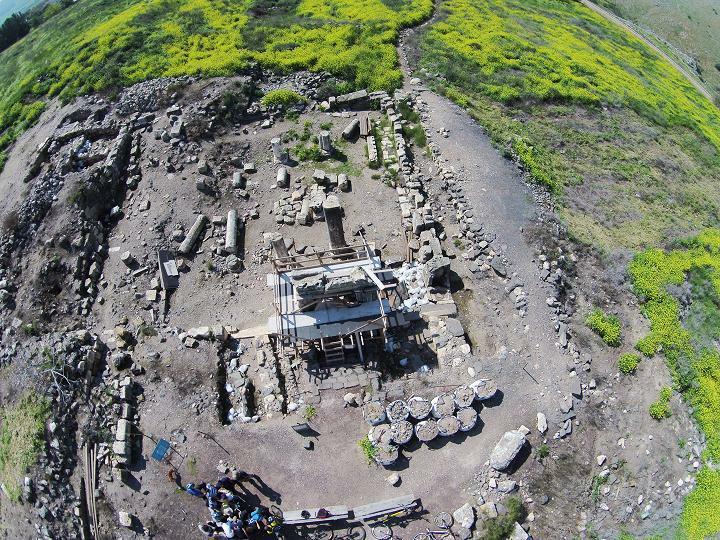 They are located 4 Kilometers north of Tiberias. They stand over Mary Magdalene's village, today a town called Migdal. The observatory terrace, where the photos are taken, are at the top of the south-side cliffs, at 181 meters above sea level. The lake is 200 meters under the sea level, so this is a difference of almost 400 meters! 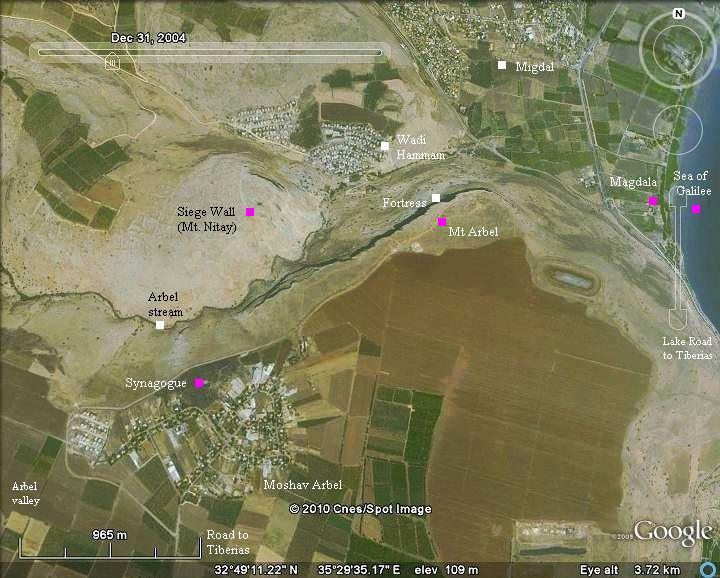 An aerial map is shown below, indicating the major points of interest around the cliffs of Arbel. Pointing on purple points will automatically scroll to the relevant photo, text or web page. A map of the Biblical period is illustrated in the following figure. 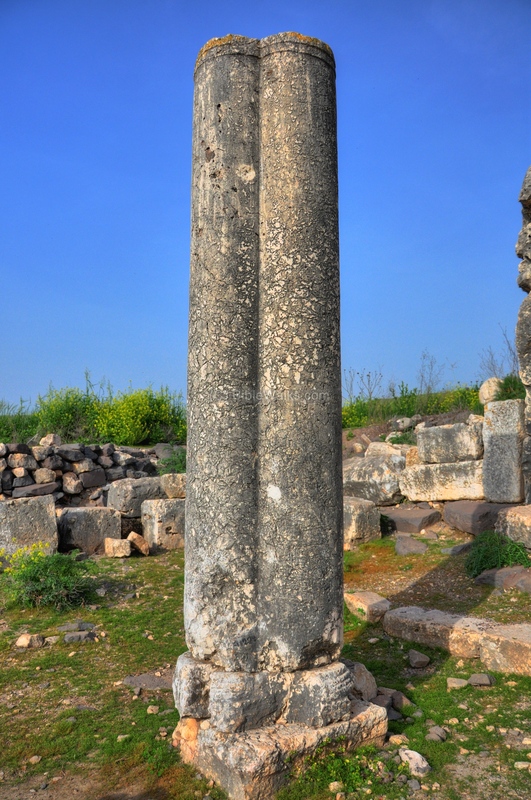 Arbel is located above the ancient trade routes between the south-west (via Yokneam or Megiddo) and the north-east (via Capernaum, Bethsaida to Damascus and beyond). Another route passes along the shores of the Sea of Galilee towards Tiberias, then south to Beth She'an (Skythopolis). The area was populated at the Persian and Greek periods, and reached its peak at the Roman and Byzantine periods. At the peak times most of the villages around the Arbel cliffs were heavily expanded, and the roads and public structures were erected. 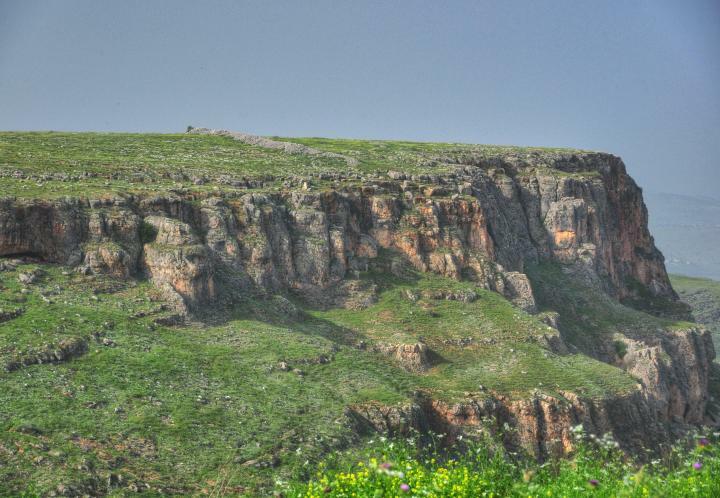 The Arbel Cliffs overlook the Sea of Galilee and show a spectacular panorama. The following photo was taken from the observatory terrace on the top of the cliffs, overlooking the north side of the sea of Galilee. The first two villages are Migdal (center left, where the road bends) and Kibbutz Ginosar (center; on the shore). Just above that, in the background on the beaches of the lake is the ancient village of Capernaum. Further to the east is where the Jordan river flows into the lake, and in its background and along the right side of the lake are the Golan heights. The following photo shows a view of the same place from the sea of Galilee. There are many caves in the cliff, some of them were used as a fort. Under the cliff, on the right side, are the ruins of the Roman city of Arbela. 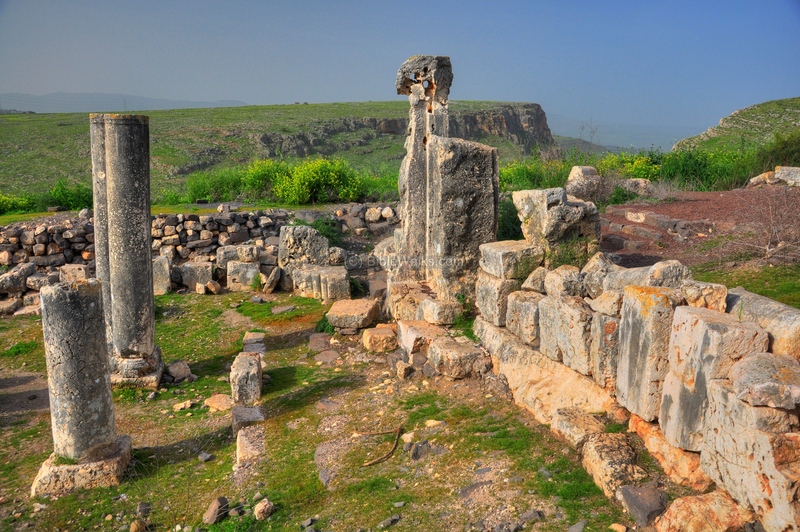 The Arbel cliffs tower over an important ancient road that connected the west of the Galilee and the sea of Galilee. In the valley between the cliffs flows the Arbel stream, which is dry most of the year. Through this passage way there was a road that went to the Netufa valley, which led to Khirbet Cana, Zipphoris and Nazareth. The way connected to Capernaum and the other villages on the shore of the sea of Galilee. The following photo is taken on top of the cliffs, looking west, overlooking the Arbel valley. On the right you can see the Arab village of Wadi-Hamam, where the road turns towards the Sea of Galilee. There is a ladder at the edge of the cliff that can be used to climb down unto a path, and walk just below the cliff. This walk is recommended for its beautiful scenery and amazing fortress built into the caves just under the cliffs. The path leads you all the way down, to a spring, which was the source of water for the ancient village. Over the Arbel valley on the other side (in the top center of the photo), another set of cliffs can be seen (called the Nithai hill, height of 98 meters above sea level and 300m above the lake). The Arbel valley actually winds around this hill, and can be see just above it in the left background, in a direction west towards the Netufa Valley, about 12 kilometers walking distance. Both cliffs are dotted with natural caves, which were used as hide outs by the Jewish rebels in the war against Herod and the Romans (read the amazing historical references below). Just above the western cliffs there is an impressive stretch of wall (321 meters long, with 9 towers) that was used by the besieging Roman forces to seal them off those hiding in the caves. This siege wall is seen in the following photo in the center of the top of the hill. On the south-west side of the Arbel cliffs, inside the modern agriculture Moshav Arbel, are ruins of a Roman/Byzantine period village scattered along the hillside. 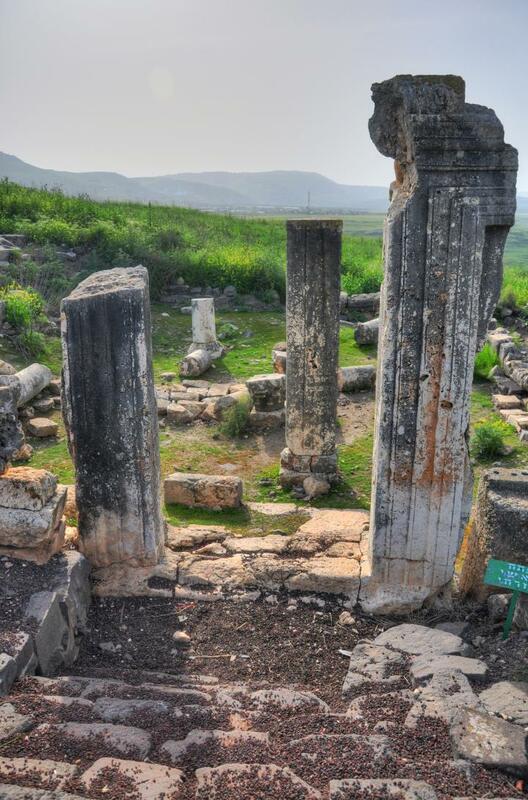 A grand Byzantine period synagogue was excavated there in 1905 by the archaeologists H. Kohl and C. Watzinger. This is a square structure, typical of the ancient Galilee Synagogues. Its main entrance is located on the eastern side, as seen below. This monolithic monumental door was carved out of a single rock. The synagogue size is 18.6m long by 18.2 wide, and has three rows of columns on the east , west and north sides. The following photo shows the eastern entrance and the south side behind it. In the far background is the famous hill of the Horns of Hittim. 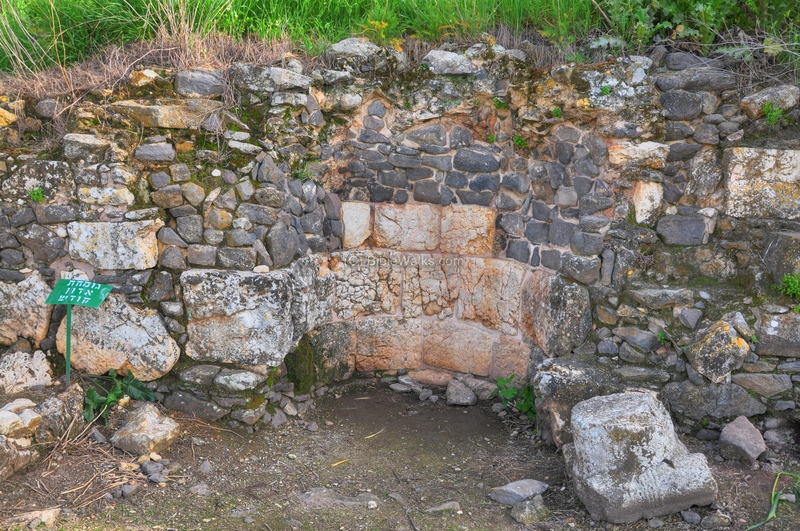 A niche for the place of the Holy Ark is located on its south rear wall - facing Jerusalem - as seen in the next picture. This is an uncommon design, since most of the synagogues head towards Jerusalem, while here the synagogue heads to the north. This special design was due to a local limitation, since the great view of the Arbel and the Sea of Galilee is on its northern side. Two of the eastern columns have a heart-shaped design, which is a common style (as in nearby Kh. Ammudim). New excavations (2012) were conducted in the area of the synagogue. This aerial view is of March 2014, with a scaffolding on the monumental door, and new trenches on the south side. 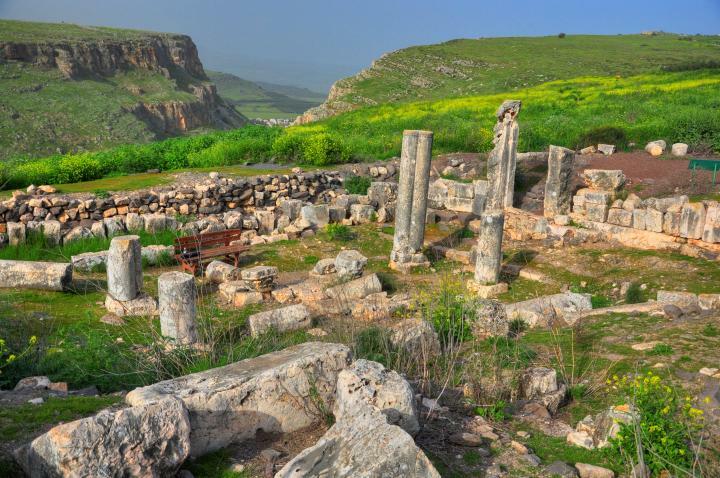 Arbel Cliffs: You can approach the cliffs from the Sea of Galilee (near Migdal), but it is better to drive to the observatory terrace through the modern Moshav Arbel, which is accessible from the exit on the main road from Haifa, just 1 Km west of Tiberias. Follow the signs and park the car at the parking lot. You can make a short walk to the terrace, or better - spend up to half a day on the natural trails. 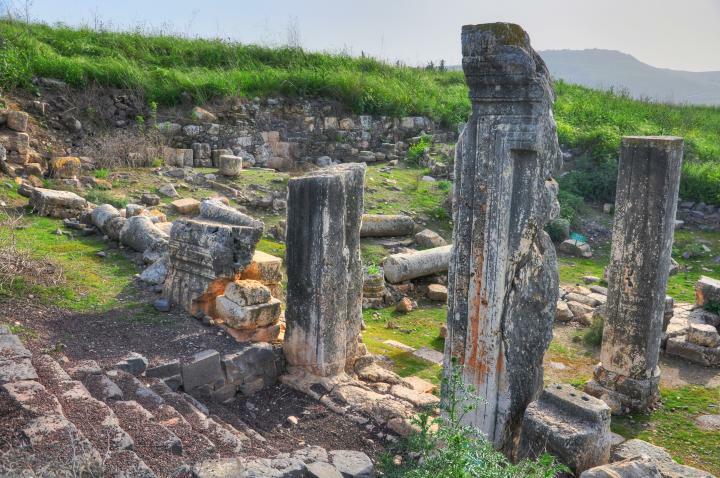 Ancient Synagogue - the ruins are located in the center of the modern Moshav Arbel. The entry is by foot from one of the streets inside the Moshav. This old testament text talks about a battle, but it is not clear if "Beth Arbel" refers to this site, although the dashing to the ground might imply heights. Note that "Shalman" may imply to Shalmaneser III, the Assyrian king who invaded to Israel in the first Assyrian intrusion (841BC), causing damages to Hazor and other northern cities. "the roar of battle will rise against your people, so that all your fortresses will be devastated— as Shalman devastated Beth Arbel on the day of battle, when mothers were dashed to the ground with their children." ".... sent Bacchides again with an army into Judea, who marched out of Antioch, and came into Judea, and pitched his camp at Arbela, a city of Galilee; and having besieged and taken those that were there in caves, (for many of the people fled into such places,) he removed, and made all the haste he could to Jerusalem". "...so Herod willingly dismissed Silo to go to Ventidius, but he made an expedition himself against those that lay in the caves. Now these caves were in the precipices of craggy mountains, and could not be come at from any side, since they had only some winding pathways, very narrow, by which they got up to them; but the rock that lay on their front had beneath it valleys of a vast depth, and of an almost perpendicular declivity; insomuch that the king was doubtful for a long time what to do, by reason of a kind of impossibility there was of attacking the place. Yet did he at length make use of a contrivance that was subject to the utmost hazard; for he let down the most hardy of his men in chests, and set them at the mouths of the dens. Now these men slew the robbers and their families, and when they made resistance, they sent in fire upon them [and burnt them]; and as Herod was desirous of saving some of them, he had proclamation made, that they should come and deliver themselves up to him; but not one of them came willingly to him; and of those that were compelled to come, many preferred death to captivity. And here a certain old man, the father of seven children, whose children, together with their mother, desired him to give them leave to go out, upon the assurance and right hand that was offered them, slew them after the following manner: He ordered every one of them to go out, while he stood himself at the cave's mouth, and slew that son of his perpetually who went out. Herod was near enough to see this sight, and his bowels of compassion were moved at it, and he stretched out his right hand to the old man, and besought him to spare his children; yet did not he relent at all upon what he said, but over and above reproached Herod on the lowness of his descent, and slew his wife as well as his children; and when he had thrown their dead bodies down the precipice, he at last threw himself down after them. By this means Herod subdued these caves, and the robbers that were in them. " "I also fortified, in the Lower Galilee, the cities Tarichee, Tiberias, Sepphoris, and the villages, the cave of Arbela,... I also laid up a great quantity of corn in these places, and arms withal, that might be for their security afterward".